Sleep has a big impact on learning. And not just when you do it in class. Sleep deprivation affects memory, cognition and motivation, and the effects are compounded when it's long-term. For those reasons, there's been lots of interest in the education world in studying the sleep habits of children and adolescents. But until now, most sleep studies have been limited to short-term surveys with small numbers of participants. That's changing with the advent of wearable activity trackers. These devices include an accelerometer that detects movement and tries to decide whether you are running, sitting or sleeping. They can't directly measure whether people are asleep, so experts say they're not as accurate as hooking someone up to machines in a lab. But they are worn by large numbers of people in the real world, who voluntarily grant companies like Jawbone the ability to gather lots and lots of data. Jawbone, the maker of a tracker called UP, has just released a study of the sleep habits of tens of thousands of students, ages 18-22, on college campuses. The information comes from 100 universities, totaling 1.4 million nights of sleep. Students aren't as sleep-deprived as we might think. The overall average was 7 hours and 3 minutes during the week, and 7 hours 38 minutes on the weekends. The tougher the school, the later the students go to bed. There was a strong correlation between rankings in U.S. News & World Report and bedtime. At Columbia, Stanford, MIT, Princeton and Brown, the midnight oil burns past 1 a.m. But these students don't sleep less over all — they're just night owls. That trait, in turn, has been linked to general intelligence. Women go to bed earlier, on average, and wake up earlier than men, sleeping more overall. On weekends, for example, the women turned in at 1 a.m. and the men at 1:43 a.m. There's been some research recently showing that, for biological reasons, women actually need more sleep than men. The nation's military academies, not surprisingly, are hauling students out of bed the earliest. Accordingly, students at West Point, the Naval Academy, the Coast Guard Academy and the Air Force Academy are the most sleep-deprived of the schools studied. The city that never sleeps is just that. Columbia University in Manhattan topped the rankings for latest bedtime and third-least sleep. At first blush, the results of this study should be reassuring. Seven hours of sleep a night on weekdays, and a little extra on weekends, is within the recommended range for young and healthy adults. "Our data was consistent with what researchers have found in academic studies — that students are in bed, on average, seven to eight hours per weeknight," says Brian Wilt, Jawbone's head of data science and analytics. But he takes a glass-half-empty view: "Framed another way, they got less than seven hours of sleep on 46.2 percent of nights. So I think it's definitely a problem." Despite all the data, though, this study doesn't necessarily capture the full sleep picture among college students. Students who buy and wear fitness trackers are presumably more concerned with their health than others, and they must have a little bit of disposable income as well. 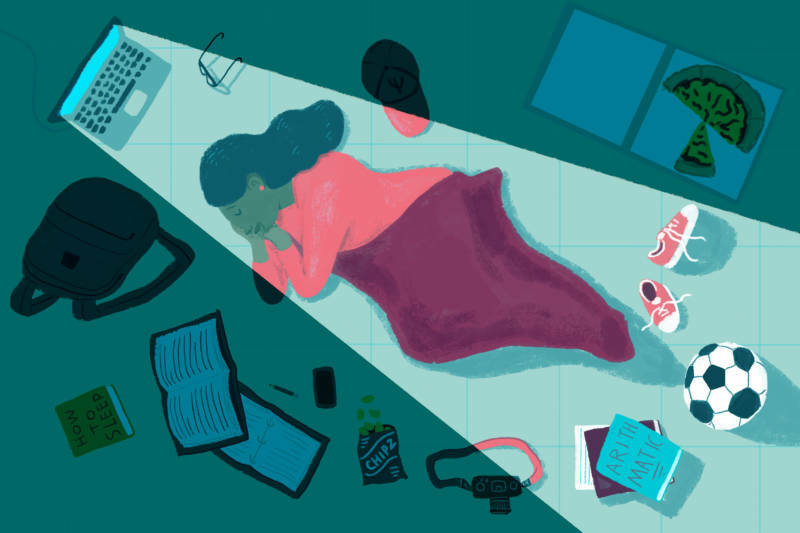 The students who are getting dangerously little sleep are more likely to have other issues in addition to their studies, such as high levels of stress, health and mental health problems, second and third jobs and family responsibilities. They wouldn't show up in this study at all.